Heat oven to 350°F (325°F for dark or nonstick pan). Line 9-inch square pan with foil, allowing some to hang over edges of pan. Grease bottom and sides of foil with shortening or cooking spray. Make brownie mix batter as directed on box. Spread in pan. Bake 28 to 31 minutes or until toothpick inserted 2 inches from side of pan comes out almost clean. Cool completely on cooling rack, about 1 1/2 hours. Freeze in pan 15 minutes. Using foil to lift, remove brownies from pan, and peel away foil. To cut brownie into triangles, cut into 3 rows. Cut each row into 5 triangles (See More About This Recipe). Set aside leftover pieces for snacking. 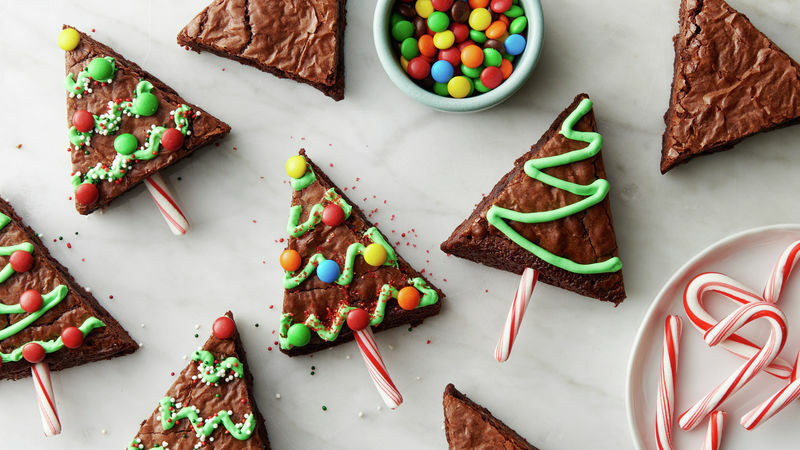 Use a plastic knife to make cutting brownie trees easier.